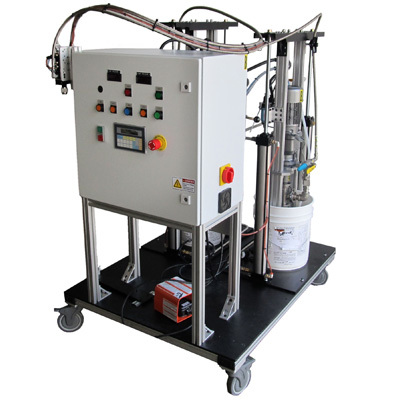 The T-2000R Multi-Component Dispensing System is a flexible, digitally controlled cart-mounted meter mix system. This system features Fluid Research® proprietary positive displacement pump technology to provide accurate dispensing from pails and drums. Fluid Research® progressing cavity pump technology provides the most efficient dispense possible, with continuous flow, no pulsation and low shear. It includes Fluid Research® proprietary microprocessor controls with a touch pad user interface. Capable of up to 75 stored dispense programs, coupled with the lowest industry maintenance requirements, and makes the T-2000R one of the most reliable, cost effective machines available. It is also ideally suited for industrial applications including dispensing high viscosity or paste epoxies, silicones, sealants, adhesives, polymers and polyurethanes. Unlike the T-2000, the T-2000R provides uninterrupted flow due to having tanks on standby.